Thousands of people have attended the funerals in Jerusalem of eight students killed by a Palestinian gunman at a Jewish religious college on Thursday. People at the Mercaz Harav seminary openly wept as a rabbi recited prayers over the bodies of the victims. Israel's government has said the attack will not lead it to break off peace talks with the Palestinian Authority. The gunman, who was shot dead by an army officer, was a resident of East Jerusalem and worked as a driver. 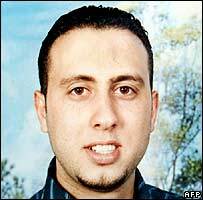 Israeli police named him as Ala Hashem Abu Dhaim, a 25-year-old from the Jabal Mukabir neighbourhood. His family set up a funeral tent outside their home there, adorned with the flags of Hamas, Islamic Jihad and the Lebanese militant group, Hezbollah. His sister described him as quiet and intensely religious, but said he was not a member of a militant group. Israeli security forces detained several of his male relatives, his fiancee, and a number of neighbours after the shooting, she added. "They surrounded the building and raided my brother's flat. They smashed it up, took things away and arrested all these people," she told the BBC Arabic Service. A previously unknown group called the Jalil Freedom Battalions - the Martyrs of Imad Mughniyeh and Gaza, claimed it was behind the attack, Hezbollah's al-Manar television channel reported. Imad Mughniyeh, a senior Hezbollah leader and military commander, was killed in a car bomb in the Syrian capital, Damascus, on 12 February. The BBC's Crispin Thorold in Jerusalem says that until Israel establishes whether the statement is true, it is unclear how it will respond. However, the outpouring of public grief will add to pressure on the Israeli government to end the peace talks with the Palestinians, our correspondent says. Palestinian Authority President broke off contacts with the Israelis at the weekend after an Israeli military offensive in the Gaza Strip killed more than 120 people. Sobbing and wailing filled the air at the funerals for the eight religious students killed in what the Israeli government described as a massacre on Thursday night. Thousands gathered outside the bullet-scarred seminary to attend the ceremony as a rabbi recited Hebrew psalms in memory of the victims, all but one of whom were aged between 15 and 19. The eldest victim was 26 years old. "The time for us has come to understand that an external struggle as well as an internal struggle is raging," Rabbi Yaakov Shapira told the crowd. Abu Dhaim entered the library at the seminary in West Jerusalem, where about 80 students were gathered, and fired an AK-47 rifle for several minutes, witnesses said. Students scrambled to flee the scene, jumping out of windows, witnesses said. A student reportedly shot the gunman twice before an off-duty Israeli army officer killed him. Dani Speigel, a student from the seminary - called a yeshiva in Hebrew - told the BBC of the loss that his school had suffered. "Well, it's very hard here in the yeshiva, we're having a very hard time. What people do not understand is that kids, 14 years old, 15 years old, 16 years old, high school kids died here yesterday," he said. The BBC's Middle East editor Jeremy Bowen says that the school was no ordinary seminary. It was the ideological cradle of the settler movement in the West Bank, which could be the reason it was targeted. Many of its students are on special courses that combine religious study with service in combat units in the Israeli army. Our editor says that those who gathered at the seminary ahead of the victims' funerals were people who were already opposed to Israeli Prime Minister Ehud Olmert's decision to engage in talks with Palestinian Authority President Mahmoud Abbas. This incident will only make stronger their determination to stop any agreements going through, our editor says. The Palestinian leadership has been split between Mr Abbas's Fatah faction, in control of the West Bank, and Hamas, who have ruled Gaza since forcing out Fatah last year. The Palestinians - without Hamas - have been engaged in a US-launched peace process with the Israelis since late last year. Hamas supporters celebrated the attack, drawing condemnation from Mr Abbas as well as Israel. Hamas described the shooting as a "natural reaction" to Israel's actions in Gaza. The Israeli operations aim to stop Palestinian militants from firing rockets from Gaza that have been hitting its border towns since it ended its permanent military presence in Gaza in 2005. There was international condemnation of Thursday's shooting. UK Prime Minister Gordon Brown said it was "clearly an attempt to strike a blow at the very heart of the peace process". UN Secretary General Ban Ki-moon called it a "savage attack", but the UN Security Council failed to agree on a statement. The Libyan representative said his country and several others wanted the council to couple any condemnation of the Jerusalem shootings with one against Israel for killing large numbers of civilians, including children, in Gaza. Israel has occupied East Jerusalem since the 1967 war and annexed the area, a move not recognised by the international community. Israel regards the entire city as its "eternal, indivisible" capital and has settled hundreds of thousands of Jews in East Jerusalem. The Palestinians hope to establish the capital of their future state in East Jerusalem, which is home to about 240,000 Palestinians.